Rules Land is a special board in Mario Party 2 that teaches the player how to play the game. 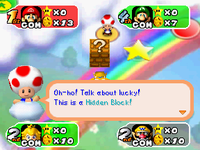 The game is scripted to roll a certain number every time so Toad can teach what space does what without the game actually carrying out events of spaces. Minigames, Chance Time, and other such events aren't played here. This page was last edited on April 2, 2018, at 21:41.